When our kids were small, they often begged us to take them to McDonald's. You can guess how they liked hamburgers and chicken nuggets. The fried chicken nuggets were really crunchy and addictive. 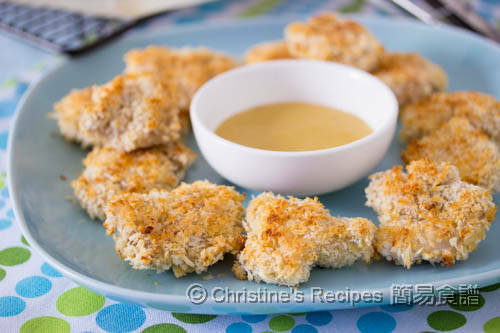 Making chicken nuggets at home is a challenge as the leftover oil is a headache-problem to solve for a not-so-often-make-deep-frying-food family. What about baking chicken nuggets instead? The experiment was a great success. The baked chicken nuggets were so good, with the crunchy outside and the tender meat inside. 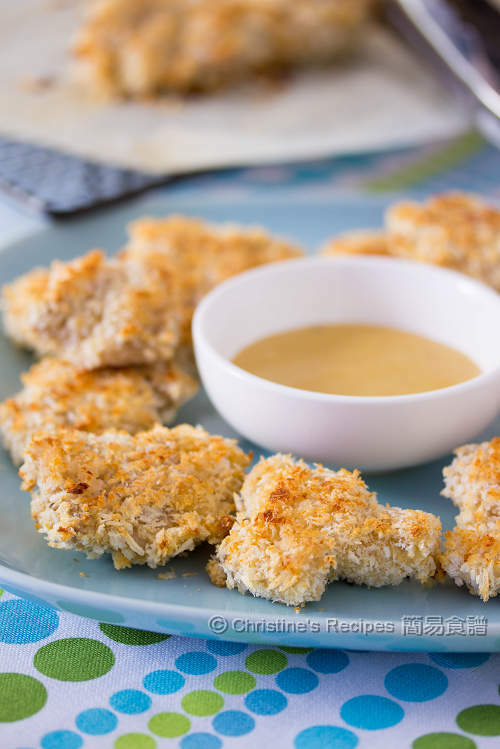 We’re totally in love with the mustard honey sauce to go with this healthy version of the snack. They are perfect as finger-food at party too. 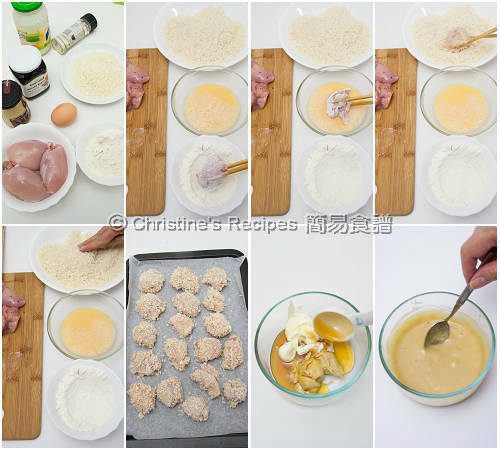 Cut the chicken into 5-cm / 2-inch sized pieces. Season with salt and pepper. Mix well. Lightly coat the chicken with flour. Shake to remove the excess flour. Dip in the whisked egg. Coat with bread crumbs. Lightly press the surface. Place the chicken on a lined or greased baking pan. Bake in the preheated oven for 20 minutes. Flip to the other side in the middle of baking. Continue to bake until cooked through. While baking, to prepare the sauce. Mix all the ingredients well in a small mixing bowl. 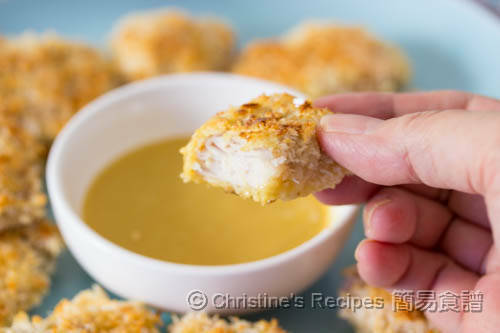 Dip the baked chicken nuggets into the sauce. Enjoy ! The mustard honey sauce can be made well in advance. Cover and chill in refrigerate for up to 3 days. Also, the chicken nuggets can be made in advance. Bake them until just cooked through. Freeze them after cooling down. When you’re craving, heat them up in a low-temperature oven. If you’re going for this route, don’t bake the chicken too long or too brown at the first round. Otherwise, the meat will turn dry after reheating. I am too nuts about chicken nuggets. Gotta try this bake version soon. Thanks for sharing, Christine.